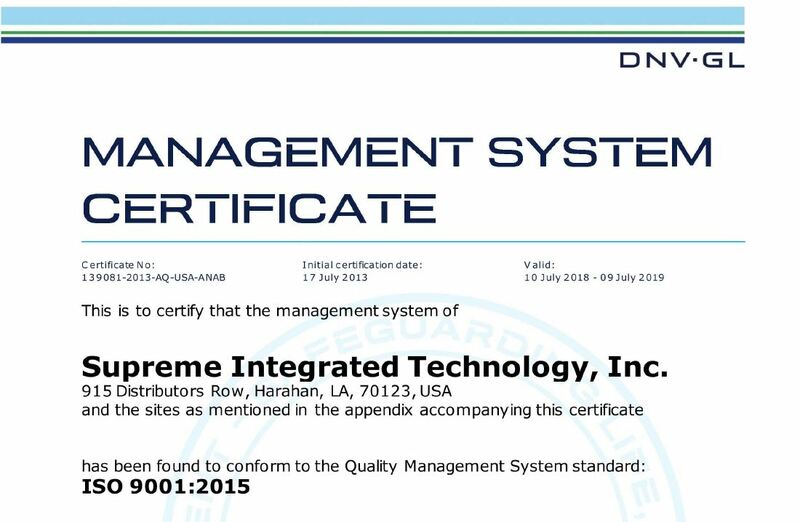 Harahan, LA – On July 17, 2018, Supreme Integrated Technology, Inc. (SIT), successfully certified to the latest International Organization for Standardization (ISO) 9001:2015 standard for Quality Management Systems. SIT specializes in the creation of hydraulic and electric powered moveable structures and jacking systems and offers single source solutions for marine, civil, industrial and military applications. ISO 9001:2015 is the most current standard focusing on performance based, quality management systems with an emphasis on risk-based thinking and increased leadership requirements. “Our team is incredibly proud to be recognized for our commitment to continuous improvement and customer satisfaction through our successful transition to the latest ISO 9001: 2015 standard,” stated Kevin Hayes, President of SIT. SIT’s ISO 9001:2015 certification is valuable for quality total solution packages, from component to system level design, equipment, and field support for structures in motion, enclosures, and machinery across a myriad of civil, military and commercial interests. This successful transition assures SIT clients can expect consistently good quality products and services which distinguish SIT from other competitors in the industry. Supreme Integrated Technology, Inc. is a subsidiary of Employee Owned Holdings, Inc., headquartered in Harahan, Louisiana, and is a 100% employee owned company. For other information about SIT and our family of employee owned companies, please visit www.supremeintegratedtechnology.com.